Ambush on Morkai is a three-player scenario that takes place on the world of Morkai, a planet in the Vengence System of the Corvus Cluster. 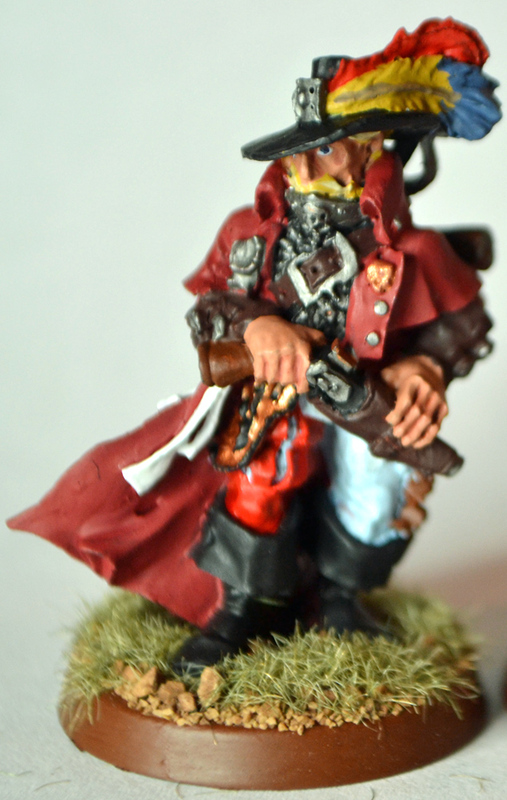 The hero of this adventure is Adeon Drake, a swashbuckling, somewhat shady Rogue Trader. He has arrived in a remote desert town to meet with an illicit trader in xeno technology, who is offering a sizable profit to anyone willing to smuggle his goods into the Belliose System. His archrival, Count Johaan Feracci, already has turned down the offer to smuggle the artifacts—after all, possession of xeno technology is a capital offense, and the risk isn’t worth the profit to the wealthy nobleman. But, in a perverse attempt at entertainment, Feracci has secretly recommended Drake to the illicit trader—with the intent of sabotaging the Rogue Trader’s plans and possibly maneuvering Drake into trouble with the local Arbiter. The third player in this adventure is the competent if dull Imperial Arbiter of this remote community—the equivalent of the local sheriff who must keep the peace. Arbiter Lano Kraz has no stake in the outcome of the feud between the two Rogue Traders—indeed, he has no idea why so many armed civilians suddenly have appeared in his town. But he is determined to keep the peace. Players should be provided individual briefings for this game—with some information not shared. 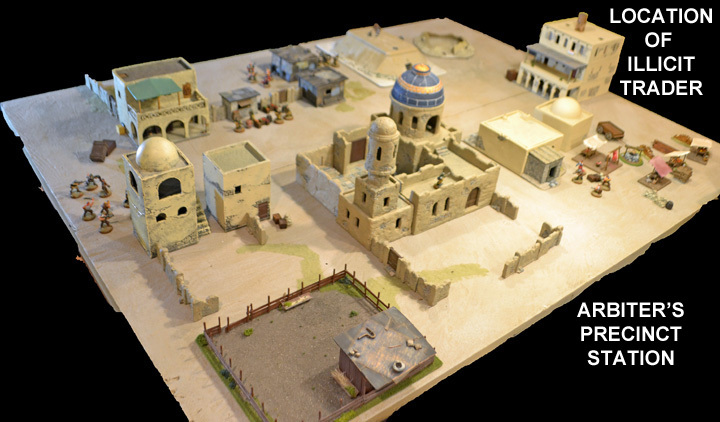 A 4-foot-by-5-foot gaming surface is suitable, although you have flexibility in designing your “battlefield.” What’s more, although the “historical” event occurred on the desert world of Morkai, any setting—from lush jungle to arctic tundra to urban squalor—will work. As this is a skirmish game, a sizable amount of terrain should be placed to interrupt line of sight, provide defensive cover, and force figures to maneuver around obstacles. Buildings are useful, but smaller terrain pieces—piles of rubble, bushes, rusted vehicles, rocky outcroppings, etc.—will aid play. Take care not to create long stretches of blocking terrain that channel movement to choke points. Walls should include doors, collapsed sections, etc. Buildings should not be too large. Multiple heights—whether ledges, balconies, rooftops—will benefit the swashbuckling nature of your game. [TheGM: If you look at the map, you’ll see a wide alley between the Arbiter’s Precinct Station and the edge of the table. That’s our corrected table. Originally, the alley was very narrow—and it was obviously a bottleneck for Drake to rush down it. So he went through the courtyard, which became a slugfest of die rolls as Drake clambered over the once-complete wall and into a melee. As a first test of skirmish-level gaming, we experimented with a combination of two sets of rules. First, we used a variant of Warhammer 40K‘s Kill Team rules. 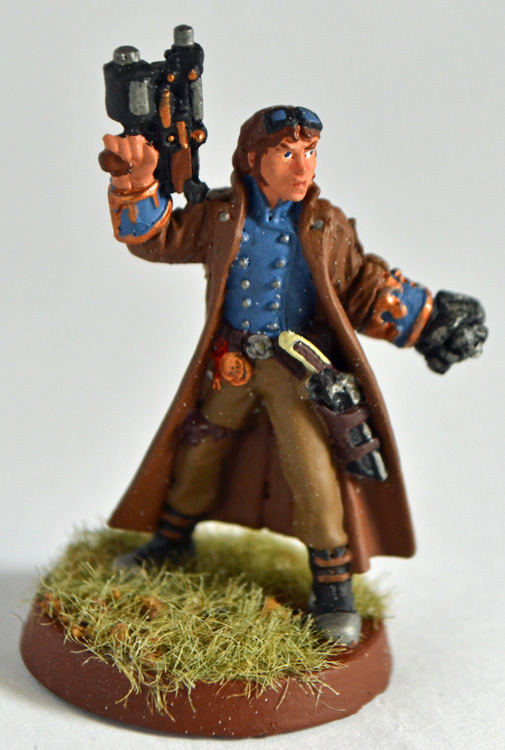 We also borrowed several features of the Doctor Who Miniatures Game, available online. * Lead characters were awarded special abilities that could be called upon throughout the game. [Example: Drake was given A Good Offense, which allows him to reroll a failed to-hit or to-wound result each melee. * We used special Event Cards that players could play at any point. [Example: If the event card, Jammed Weapon, was played, a designated figure’s weapon did not work until repaired. * We used a random turn sequence, which did not allow players to know the order of play per turn. Thus there are three move/shoot phases in each turn (one for each player). A d6 or three player cards can be used to determine order of play. But have each player complete his turn before determining the next player. Each player should be provided with a briefing. The game experience is enhanced if players are unaware of the victory conditions of other players. For example, the player of Drake will likely play a different game if he believes Count Feracci is competing for the xeno technology–rather than planning to kill Drake. A GM is recommended, and, if necessary, he can play the Arbitor and his Enforcers. In theory, this could be a two-player game—with the Arbiter and Enforcers following a set patrol and responding to any gunfire or violence in their line of sight. You can work out the protocols with your opponent. You are Adeon Drake. You are a Rogue Trader—dashingly handsome, swashbuckling, and somewhat shady merchant who roams the stars of the Corvus Cluster looking for a profit. You’ve come to Morkai—a small desert planet in the Vengence System—to meet an illicit merchant who deals in xeno technology. He’s offered you a sizable profit to smuggle some artifacts into the Belliose System. He is waiting for you at a tavern on the far side of town. You goal is to meet with him and collect the artifacts–and arrange payment. You could send an underling, but you’d rather not. Possession of xeno technology is a capital offense, and you’re not all that eager to trust any crewmen with such valuable merchandise. They’re a loyal bunch … but still not exactly honest. No use tempting them. You have a problem, though. You’ve just seen several thugs who work for your archrival, Count Feracci, and that spells trouble. Also, the local Arbiter has deployed Enforcers to the streets in numbers. It’s unlikely they know what you’re up to, but they’ve realized that all these strangers in town is out of the ordinary. Maybe you can put their presence to good use …. You deploy your figures first anywhere on the south side of town. So you’ve decided to make Drake’s life a bit uncomfortable. There’s a trader in the local tavern who approached you to smuggle some illegal goods. You declined, but you recommended Drake. Now Drake is here, and you’ve hired toughs that are deployed throughout the town. Nothing like a little ambush to entertain you. Of course, the presence of the Arbiter and his Enforcers is a bit of a bother. You’re not going to let them spoil your fun … and maybe they’ll prove useful. You deploy for troops last. You may deploy anywhere on the northern half of the table. Your are Arbiter Lano Kraz. You and your band of Enforcers are stationed in this isolated, poverty-stricken community to maintain the peace and enforce the law. An influx of strangers in your small town has you on edge. They’re armed, and they look tough. But they haven’t broken any laws, and you’re not going to risk any escalation of tensions by confronting them. But you are watching. If you witness any crimes (damaged property, violence) you and your men will attempt to detain the perpetrators. You and your men will not use deadly force, however, unless such violence is used by others. And if they do, all bets are off. You deploy second, anywhere on the table. If trouble starts, you must arrest the leaders of the factions and lock them in your Precinct Station. Once you have arrested a man, you are responsible for his safety. Each player is the “hero” of his faction. So if someone is playing Drake, and he is killed, that player loses—regardless of the victory points. An Arbitor or Enforcer can only arrest a character if he witnesses a crime (breaking into a building, firing a weapon, assaulting another character). In our excitement, we forgot that—and allowed characters to be arrested for “acting suspicious” if the GM made that call. A leader cannot command by remote control. Figures must stay within visual sight of their leader, or you might give the leader and one other figure a communicator so that two separate forces can operate independently. Another option: If a figure is isolated, make a Leadership roll or the figure stays/withdraws to a safe position until it makes another Leadership roll. Leaders may negotiate, threaten, etc. if within line of sight and 18″ of one another—or if they are within 4″ of one another and can communicate through doors, windows, etc. A leader can seek sanctuary with any Enforcer or the Arbiter. If no crime has been witnessed, seeking protection with a law officer does not count as being “in custody” and no victory points are scored. For our scenario, we used a leader, a subleader, and six crewman/goons/enforcers. But these force could be significantly larger, although the Arbiter should have a slightly smaller force with better quality. TheGM: For a fun skirmish game, I strongly encourage the use of Event Cards. Not only do they add a bit of uncertainty to the game, there is something in the human psychology that is attuned to the physical nature of card. You’ll find a useful set of cards in the Doctor Who Miniatures Rules (DWMG). What makes these cards so fun? I’ve seen players ignore any special abilities written on their character sheet but practically “strain at the leash” to use a card. Sometimes I’ll see a player standing at the game table, leaning forward, tightly gripping their card–all in anticipation of playing the card. There’s just something in the human mind that relates powerfully (and amusingly) to any ability placed upon a card—the card gives the special ability or event a physical presence that just resonates with the human mind. Being able to touch—to handle—the card allows the brain to associate more directly with what the card result. If you want players cheering and groaning as they play, you definitely want a set of Event Cards. 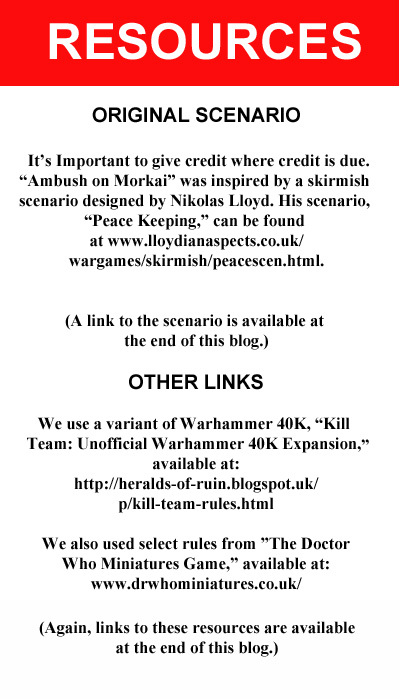 To that end, while I used the DWMG cards for our playtests, I intend to re-edit them to create cards to fit the 40K theme. An appropriate quote—”Suffer Not the Heretic to Live”—might work well for a Marked for Death card that allows you to reroll failed to-hit rolls. Or how about, “The Emperor Protects,” for a card that allows you to avoid a to-wound result? There are many online printing companies that will produce some nicely designed cards—with all the artwork you can provide. Just shop around. Peace Keeping scenario – the original scenario from which Ambush on Morkai was designed. Shared with permission. 7TV 2nd Edition – the original “free” Doctor Who Miniatures Game is no longer available. It was an excellent if simple skirmish game with some great ideas on event cards and wonderful ideas for special abilities for characters and event cards. Realizing they had a good rules set, its authors have published the rules in a new format, as 7TV, with a theme of recreating cheesy British sci-fi, spy, and adventure TV shows of the 1960s and 1970s. It is the same rules, just without the stats for Doctor Who.